The Road to the Isles made up the toughest day of walking I've ever done. About 23 kilometers (14.5 miles) across some very boggy high moor and mountain valley, followed by another 13 kilometers (8 miles) along a road. But it was great! The path is in the Scottish Highlands near Ben Nevis. See the location in this map. No, one does not simply walk into Mordor. One wades into Mordor. And then it gets even boggier and you think you may have to do some swimming. The West Highland Railway runs from Glasgow north to Mallaig, with a short detour to Fort William. Yes, Harry Potter fans, the section between Fort William and Mallaig features in those movies. The West Highland Railway stops along the way at Corrour Station. It's a rather peculiar stop. At an elevation of 408 meters it's the highest railway station in the U.K. But stranger yet, it is not accessible by any public roads. The straight-line distance to the nearest public road is almost 18 kilometers. That's right, the train stops at an isolated building in the middle of Rannoch Moor. Other than the rail line, no other man-made structure is visible. A rough track leads off to an isolated lodge to its northwest, and another lodge and a youth hostel to its northeast. That's it. Oh, except for a somewhat difficult to notice footpath leading through the boggy moorland. That footpath is The Road to the Isles, following an ancient route used by cattle drovers in the years before the Highland Clearances. The Road to the Isles follows the single-line West Highland Railway northwest for about 4.5 kilometers from Corrour Station to the south end of Loch Trèig. From there it runs more or less due west along a dramatic valley between major mountain ranges — the Aonachs, Grey Corries, and Ben Nevis to the north, and the Mamores to the south. It follows Abhainn Rath upstream from Loch Trèig to the watershed between Sgurr Chòinnich Mór and Meall a' Bhùirrich to the north and Sgurr Eilde Mór to the south, where both Abhainn Rath and the Water of Nevis have their origins. The path continues west from there following the Water of Nevis downstream to the upper end of Glen Nevis. The valley narrows into a very dramatic gorge steeply descending to the car park at the end of the road running up Glen Nevis. From there it's a simple if long walk along the road into Fort William. I followed the highly recommended route from east to west, as described above. That way you're generally descending and it gets easier toward the end. Plus, you are walking to a town. Corrour Station is just an isolated station with infrequent rail service. I would expect it to always be rather boggy, unless you were doing it in winter when it's frozen. DANGER — Do not attempt the walk described here without taking proper precautions. You could die, and the hurry coos will pick your bones. One does not simply walk into Mordor. First things first. 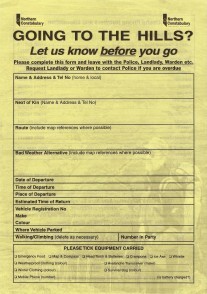 Fill out a hill-walking form from the Northern Constabulary and leave it where you're staying. That means there's a chance that you can be found if you go missing on the isolated high moors. Seriously. It's eighteen kilometers to the nearest road, and that's when you're at the relatively civilized starting point at the railway station. Next, make sure you have food and water. There's a nice supermarket near the railway station in Fort William. Stock up and prepare the evening before. You should have a map, like the excellent Ordnance Survey "Explorer" 1:25,000 map series. Their Explorer #392, "Ben Nevis & Fort William" covers most of the route. However, the first section is only seen on Explorer #385, "Rannoch Moor & Ben Alder". 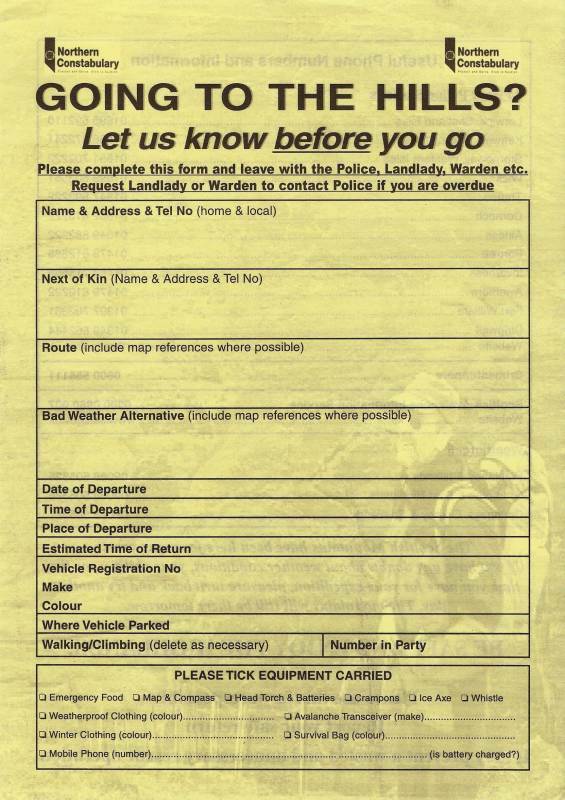 An alternative with less detail would be the Ordnance Survey "Landranger" 1:50,000 series. Landranger #41, "Ben Nevis" covers the entire route at 1:50,000. See my page about navigating with GPS and Ordnance Survey maps if you don't already know how. Of course, you might be able to get by with less, like a photocopy of the description of The Road to the Isles in Lonely Planet's Walking in Scotland and Walking in Britain. See my name in the acknowledgements for contributing information to the second title, or at least in the 3rd edition, from April 2007. Hand drawn and ImageMagick annotated map of The Road to the Isles. Whatever sort of cartographic aid you have, you should have had it for a while so you could study it and familiarize yourself with the route you're about to attempt. You will notice that since much of the route is almost exactly due west, you can use just the easting portion of a GPS position to estimate the distance remaining. The narrow opening of the gorge down out of the high valley into Glen Nevis is around easting 1740 (roughly NN 1740 6880). However, do not rely solely on a delicate battery powered device for your navigation! My time was pretty close to this, at least overall. The first section to Creaguaineach Lodge is pretty easy and goes a little faster. The second section took maybe three hours instead of two, because of all the backtracking and wide detours to get across the swampy area around where Allt Gleann na Glubhsachan flows into Abhainn Rath. See, I told you that the 1:25,000 Ordnance Survey maps are great! It would have been even longer without that. The third section, from Lùibeilt (also spelled Lùb Eilde) to the road head, went a little faster than they estimate. I left Corrour Station at 0840 and arrived at the roadhead at 1640, so the path across the moors took eight hours. From there you have another eight miles to get into the center of Fort William, so plan ahead.